Just after Apple collaborated with Hermes on their smart watch, now Louis Vuitton came up with its own version of a luxury smart watch, the Tambour Horizon in partnership with Google and Qualcomm. This watch was designed to serve the world traveler—Vuitton’s core customer. The watch costs anywhere from $2,450 to $2,900. With the Tambour Horizon you can select the digital face you want. It has 30 easily interchangeable straps for men and women, it notifies you of calls, texts, and emails; has an alarm, a step counter, indicates the weather, in addition to time. The great news is for customers living in China, currently they have to buy 2 different watches when they travel, with the LV watch they will only have to buy one as it operates on both world and Chinese systems. Would you consider buying it? Gucci Décor is the latest hype to be launched this September by Gucci. The collection is very inspired by their eclectic fashion line. Additionally, four scents for both candles and incense have been developed by Michele — Inventum , Fumus, Herbosum , and Esotericum. In addition to the above, cushions and a range of wallpapers in silk, vinyl, and paper will be offered for those who want to make a strong statement with strong Gucci patterns. Gucci Décor progressively roll-out globally in Gucci flagship stores, online at gucci.com and select boutiques. I have mixed feelings about this collection, what are your thoughts? Check the slideshow below and share your thoughts! When I think of the future, I can’t help but remember how we imagined it to be back in the Eighties. Everything we thought would remain science fiction became part of our present. Touch screens, mobile phones, laser printers, carbon fiber, etc.. were all just part of movies and our imagination. Now we know, nothing is impossible and we also realized that the present and future will not be the same without going back to nature. For a couple of decades now minimalism was prevailing with the rise of technology, but not anymore. New trends have been emerging in the past few years and some are about to stay around for a while while others are perishing. 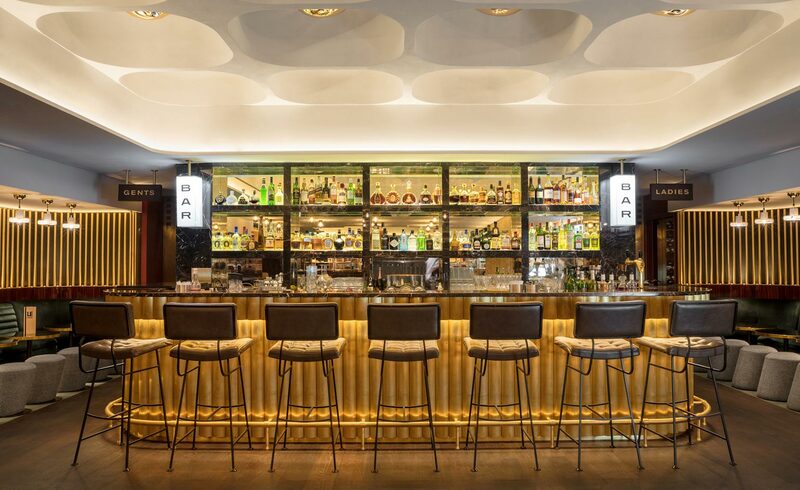 As recent interior design trends have been focusing on the operator rather than the consumer, this has created a great shift in all things design. Workspaces, for example, are now focused on the employee rather than on the visitor or consumer. This innovative idea has been brought forth by firms such as Google, Facebook, Leo Burnett, Deloitte & Touche, Cisco, and many others. Numerous studies have suggested that a healthy and comfortable work environment produces better productivity, this may not always be true but has been an eye opening approach for many. 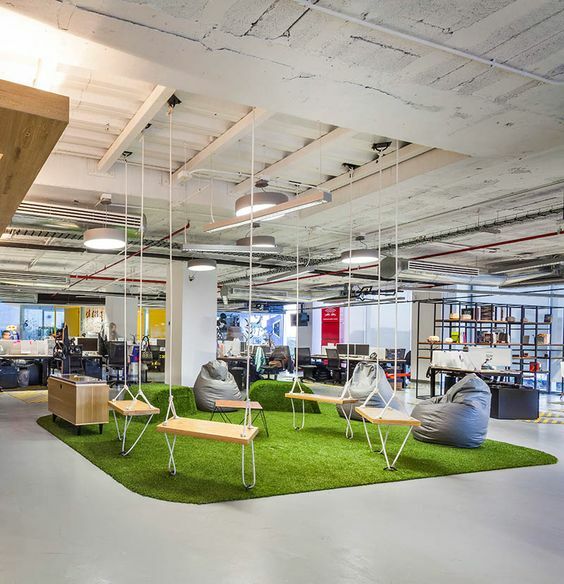 These firms have come up with ideas we once though of as crazy, such as having pool tables, a gym, cafes, napping zones all at the company’s premises. With this in mind, the human is now the focus of all present and future trends. Focus now is on well being, healthy lifestyle, and communication. As a result, new design trends emerged and were made possible with the use of materials that are more human and environment friendly. 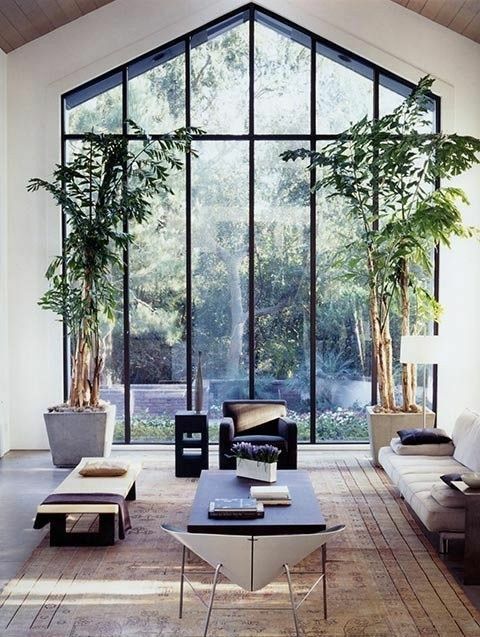 1- Bringing Nature inside, and almost every other trending material is there to compliment this one. Greenery and nature are everywhere now, restaurants and cafes, entrances, airports, homes, etc.. no space is complete without greenery anymore. It is not a surprise that Pantone’s 2017 color of the year was Greenery! From fake to natural, green is everywhere and here to stay. Integration of nature and natural elements in our spaces and through our architecture has become a requirement now. This is why we are opting more and more for large windows and focusing more on the view. It might be a psychological attempt to replace the damage that has been done to our environment in the past decades. At Place de l’Étoile end of the Champs-Élysées lies Le Drugstore Publicis founded in 1958 by Marcel Bleustein-Blanchet, founder of the world-renowned advertising agency Publicis Group, Publicis Drugstore was designed to bring American consumer convenience and bar culture to the Parisian public.The complex offered a diverse array of goods under one roof such as books, pastries and jewellery to cigars and champagne. 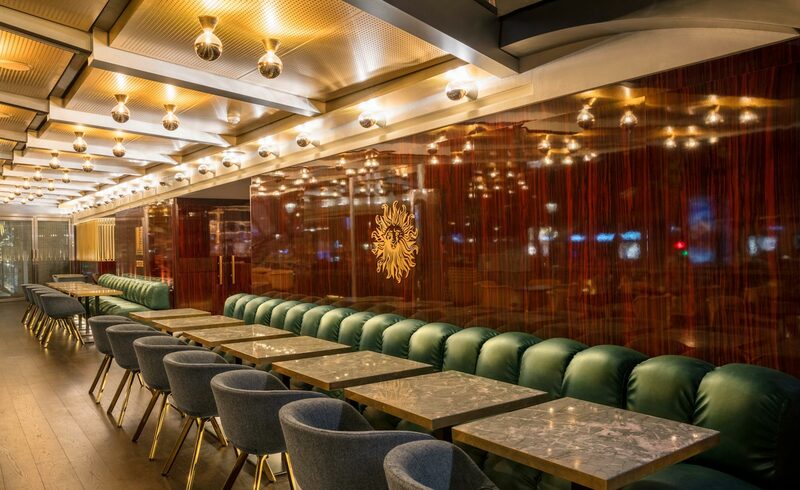 Recently, Design Research Studio by Tom Dixon did a complete renovation for their restaurant and terrace. Apple Dubai Mall is reinventing the traditional introverted idea of mall-based retail as a more outward looking experience that engages with the spectacle of urban life. Its design is a highly innovative response to the culture and climate of the Emirates, while also demonstrating Apple’s pioneering ambition to create inspirational civic spaces for all. Flipping through my favorite online platforms, I came across this lovely article of a Lebanese home/ retreat in Faqra, Lebanon belonging to Nicolas & Michele Garzouzi on Architectural Digest. Legendary fashion designer Elie Saab collaborated with The Rug Company on a collection inspired by his signature design elements: femininity, luxury and modernity. Saab created three modern rug designs that revolve around themes such as foliage, floral motifs, texture and abstraction. The collection was presented in Beirut at The Rug Company showroom in the presence of media and other guests. The rug shown above is ‘In Bloom’, it features oversized florals in shimmering silk tones of teal, gun metal and green. 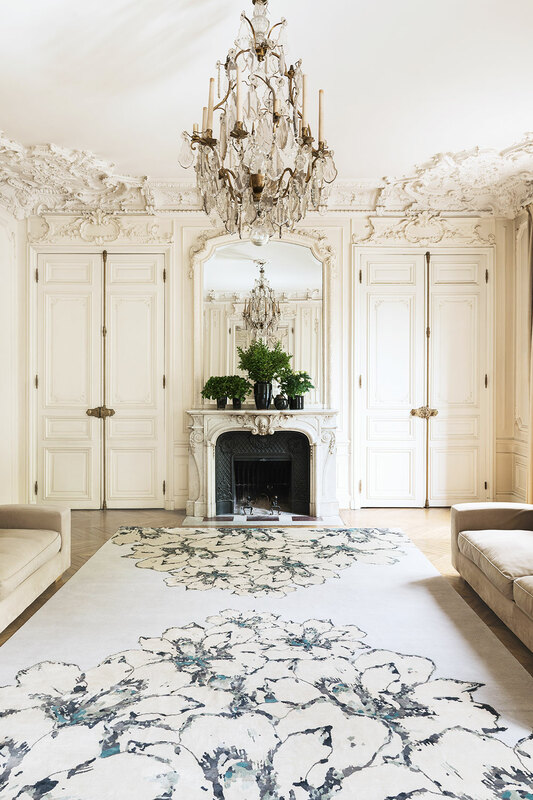 Challenging the traditional format of a rug, the blooms burst from both ends of the rug and reach for its centre, creating an elegant mirror pattern.